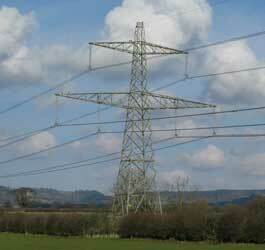 Most 400 kV power lines are carried on standard lattice pylons and we give details of the fields they produce. Here, we give information on fields from some less common or more recent designs of 400 kV lines. 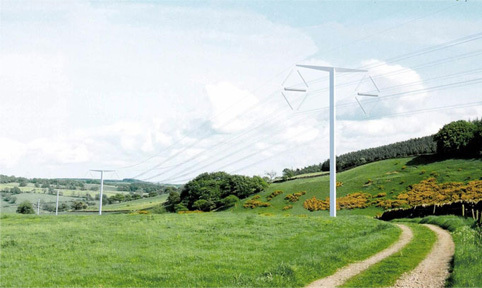 National Grid is proposing to use a new design of pylon, the "T-pylon", as an alternative that could be offered alongside the traditional steel lattice pylon in some circumstances. The design is evolving - the figures we give here are for the current draft proposals for the first generation design, and as the design evolves we will update the figures. The following graph compares the T-pylon with an existing traditional lattice pylon design for the same standard conditions. 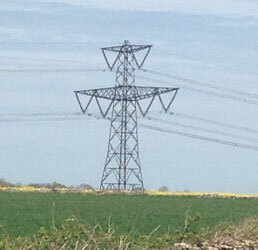 The conditions are a current in each circuit of 500 A, and a clearance above ground of the lowest conductors of 12 m.
"L12" (in blue) is the standard lattice steel pylon National Grid has used for some time. "T-pylon" (in red) is the new design shown in the picture. The T-pylon is a more compact design with the conductor bundles closer together, so close to it, it produces a lower magnetic field. But it has the conductors in a triangular arrangement instead of roughly linear, and the benefit of phasing in reducing the field is less for triangular arrangements. So to the sides of the line, the fields end up fairly similar. The graph above shows the fields for the same standard 500 A current in each case, to make the comparison more straightforward. These are the same standard conditions we use to illustrate how various factors affect the field from a power line and is typical of existing National Grid lines. But the T-pylon is capable of carrying larger conductors and therefore larger currents than the L12, and therefore the maximum magnetic field it could produce would be larger (see examples of the difference between typical and maximum fields). In a situation where a new line needed this larger capacity, if we were erecting traditional lattice pylons, we would not use the L12 design but the stronger L13 design. For completeness, the following graph compares this as well (for the same standard 500 A current). As it happens, although the L13 is a stronger design, it has a similar geometry to the L12 and therefore produces similar fields. Of course, specific lines can carry higher currents. See a graph illustrating the general principle of how field varies with current and example of a calculation for a specific line with a higher than average current further down this page. 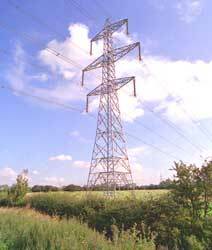 Traditional UK pylons have the three bundles of wires that make up each circuit roughly vertical on each side of the body of the pylon. Occasionally, though, a low-height design has been used, as shown in the photos, with the bottom two bundles roughly side by side on a longer crossarm and only the one bundle above them. The following graph shows the effect of this on the magnetic field. Basically, it makes little difference - the central peak of field is slightly wider because of the extra width of the outer conductors, and the field falls slightly less rapidly with distance, because the benefit of transposed phasing is less when the conductors aren't in a straight line. Comparison for 1 m above ground, 12 m clearance of lowest conductors, 500 A per circuit. National Grid has just a few examples of low-height designs like this in service, of two different designs. The L6 was the standard design of larger pylons for a long time, and it had a low-height variant called the L9, shown on the left above. More recently, the L12 has been the standard pylon for new lines, and it has its own low-height variant, shown on the right. The graph above is for the L12. New lines might be built with a new design of slightly higher capacity, the L13. There is not yet an equivalent low-height design, but it would follow the same principles as shown on this page. Note for connoisseurs: the L9 is the one you see as you drive on the M4 just east of Bristol. The L12 is the one you see near Thirsk in Yorkshire. You can tell them apart because the L9 has "V" string insulators and the L12 has "I" string insulators. 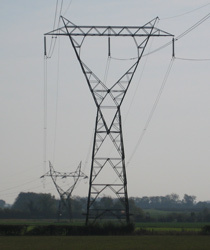 Traditional high-voltage UK pylons have two circuits, one each side of the pylon body, as shown on the left. (The three bundles of wires that make up each circuit are usually arranged roughly vertically on each side, as here, but see exceptions on this page, the T-pylon and a low-height design). Occasionally, though, only a single circuit is neeed. This could be achieved by using just one side of a normal pylon. But there is one example, in Yorkshire, shown on the right, where a single-circuit design called the L34 was used. The following graph compares the magnetic field with a standard double-circuit design. The field is higher, even though the total current is halved, largely because there is no benefit from transposed phasing. This L34 design is rather old, and can only operate at 275 kV not at 400 kV. So if a single circuit pylon were needed again, it would be a new desgn. But the principles shown above still apply even if the details were different. Note also that another way to design a single-circuit pylon is still with a central body but two crossarms on one side and one on the other. The pages on this website that give magnetic fields for various voltage power lines, and specifically for 400 kV power lines, give calculations for "typical" loads. These are the loads that are typical of the whole National Grid system. But we know some lines generally have higher loads. (more on how magnetic fields depend on loads) One example could be lines to connect new nuclear power stations - see the an example on National Grid's website. The following graph gives the magnetic field for 1100 A (assuming a typical 12 m clearance - the peak field is very dependent on the clearance). Note also: 1100 A is about twice the typical load we normally use when calculating fields for 400 kV lines. But there could, of course, be circumstances in future where the load was even higher - in which case the magnetic field would scale proportionately.